There are only a handful of recipes that I can say without a doubt I’m proud of making and I’ve achieved a gold star in my kitchen for making. That is true for this bibimbap I made last week. I had originally planned on making quinoa “fried rice” for dinner complete with egg on top and loaded with vegetables and spicy ingredients, and then I thought to myself: what if I put it in a bowl and labeled it as a bibimbap instead? Ta-da! 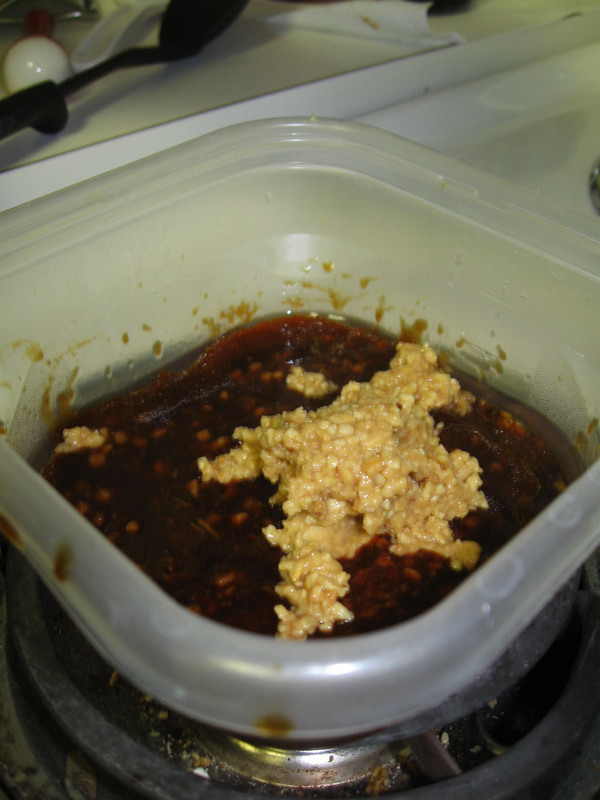 The first thing I had to do was look through my fridge and pantry and make sure I had at least four main ingredients: sesame oil, soy sauce, sriracha or chili sauce and ginger. Everything else I could compromise on not having in the dish (though that would have been a disappointment). I definitely want to experiment with different ingredients next time, and maybe even different marinades and spices. You could also make this carnivorous with some pork, Korean-style grilled beef or chicken! I always take it as a good sign when the husband requests a dish be made at least once a week or once every two weeks as one of our meals for the week. And I can’t argue with him there on that one. Simple bibimbap loaded with quinoa, shiitake mushroom, marinated tofu and vegetables. 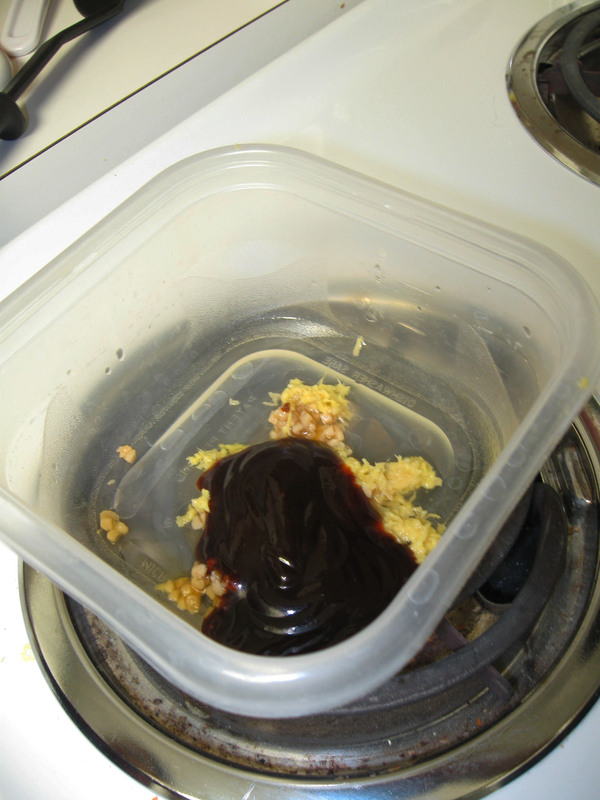 Combine cut tofu, soy sauce, garlic and ginger in a large zip-close bag or container and toss lightly to coat well. Be careful not to break up the tofu. Let marinade and refrigerate for 30 minutes. In a small bowl, combine thinly sliced cucumber, sesame oil, Mirin (rice vinegar) and toasted sesame seeds. Toss well, cover with plastic wrap and refrigerate for 30 minutes. Add tofu and cook until browned on all sides, about 5-8 minutes. 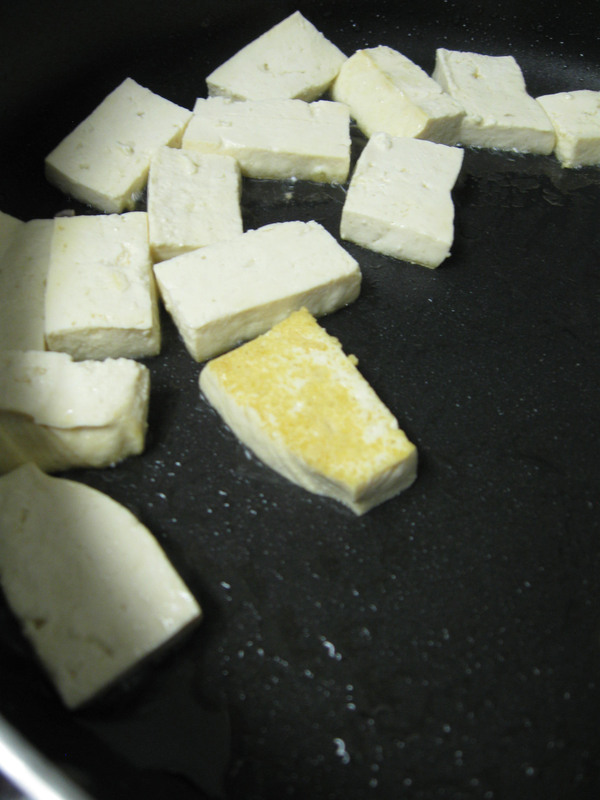 When tofu is browned, remove from skillet and set aside. In two large bowls, split quinoa in each (1/2 cup each). Divide mushrooms, cucumbers, carrots and tofu in half and arrange around outer edge of each bowl. In the same pan you toasted the sesame seeds, cook one egg for each bowl. We chose to cook our over easy, but you could do sunny side up, poached, whatever your preference. 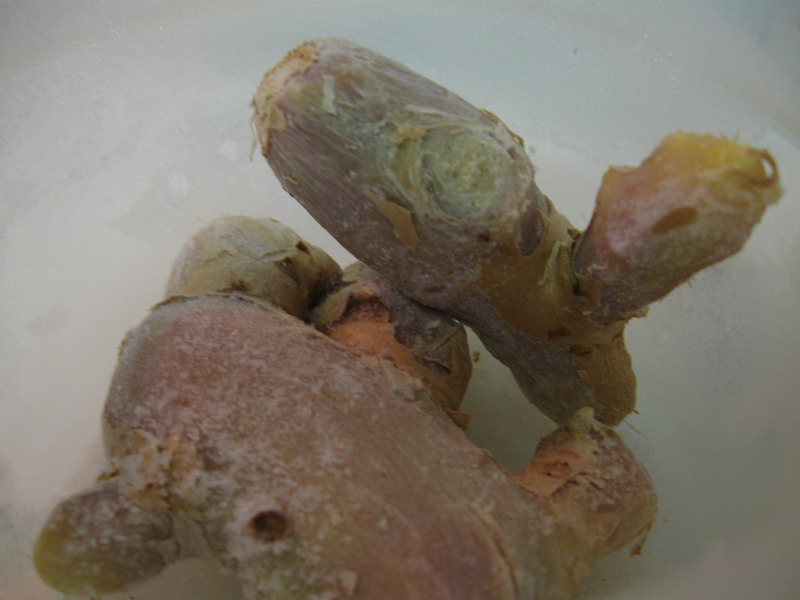 This entry was posted in Asian, Food on January 24, 2014 by Aparna B.. If any of you follow the weather or look at your smartphones at the weather map, you already know that it has been ridiculously cold throughout the country this week. With wind chills in the negatives and the highs in the single digits, this January weather has not made my morning commutes all that pleasant. My coworker Rob and I ride the same bus in the morning, and our mean bus driver refuses to drop us off closer to work like other buses do. She has no pity for us and she isn’t a morning person. With our transit center in town being rebuilt, the buses are lined up across the street from it. Not a huge deal, except it adds about 2 minutes of walking to our normal walk to the office. Also not a big deal, except when it’s -6 degrees with a windchill of -20, so by the time you do get to the office, your legs are nonexistent, as is your face. And hey, I dress for cold weather. I live in Michigan, I’m not an idiot. But no matter how warm you dress, or how many layers you wear, or how tight you have your scarf, nothing can prepare you for that cold that hits your face gets when you step off the warm bus. Then when you get home your dog, who has a double coat and is made for weather like this, wants to play outside. And since the light is staying out longer each day, you feel guilt if you don’t play fetch with him in the backyard before you feed him. Routine, people. I’m getting used to it. Cold weather. Also getting used to it. I have to come to terms with the fact that we most likely will not have an unusually warm winter like we did last year. Sad truth. But there are things you can do to help. And that’s to make soup. Not just any soup. Vietnamese soup or Pho. So that’s exactly what I did. I’ve never made pho before but I have had it and if I didn’t live in Ann Arbor – the city where hippies and yuppies coexist harmoniously – I might not be able to find decent vegetarian pho that isn’t made with meat broth. There are several places that make some decent pho around here, but I decided to try making it myself. And you know what? It was PHOnomenal. See what I did there? Try it. It’s delicious and while I did use a shortcut to make this version, it turned out great, reheated great (for REB after class), and kept me warm while watching Full House reruns. Don’t judge me. I’ll never tire of Uncle Jesse and the whole gang. Easy Vietnamese noodle soup to warm you up this winter. While the water comes to a boil, pour the entire carton of soup base into a large saucepan or pot over medium heat. Add the soy sauce, ginger discs and sliced Serrano pepper and heat through stirring occasionally. In a separate pan or skillet heat the olive oil. When it is hot, add the sliced mushrooms and cook until browned and tender, about 5-8 minutes. Remove the mushrooms, transfer to small bowl and set side. In the same pan, add the tofu slices and cook until browned on all side, another 8-10 minutes. When the water is boiling, remove from heat and add the rice noodles. Let them sit/soak in the hot water for 8 minutes until softened. When done, drain and rinse noodles under cold water. Divide noodles among all bowls. Ladle some of of the broth over noodles, enough to slightly submerge them. What foods are keeping you warm this winter? 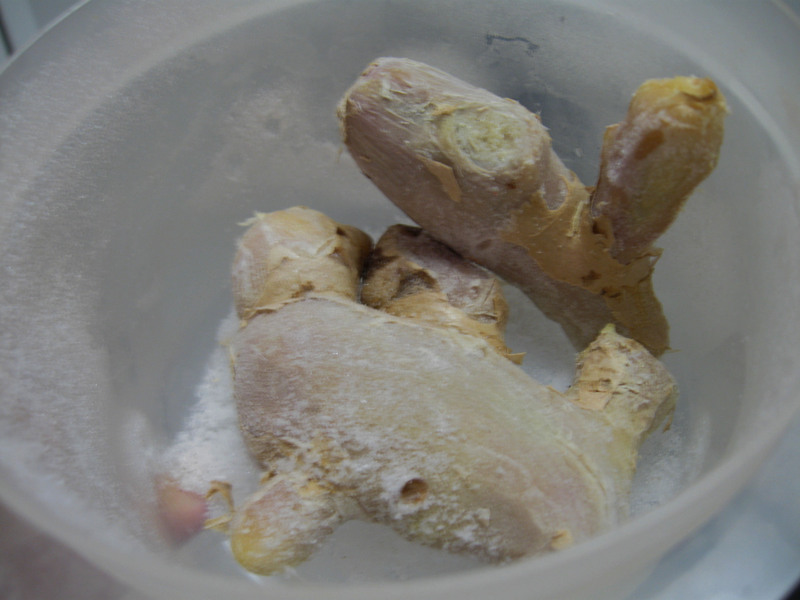 This entry was posted in Asian, Food, Soup and tagged cold, ginger, mushrooms, pho, soup, tofu, vegetarian, vegetarian pho, Weather on January 27, 2013 by Aparna B.. So I’ve been kind of bummed the past few days. It’s nothing major, but it still has me bummed. Due to class schedules of both REB and my sister-in-law, looks like the Vermont trip won’t be happening this year. My in-laws have their time share every year during the 14th week of the year, which in normal cases would be April 1-5. That’s what we originally planned for. However, the time share folks consider a week to be a full Sunday-to-Sunday week, which in the case of 2013, was Jan 6-13. So long story short, week 14 of 2013 in their eyes is actually April 8-12. That’s REB’s last week of classes for his first term and my sister-in-law’s professor grades based on attendance and that week is a big one for her, too. I think REB and I might go some where else the first week of April though, just he and I, so we can still have time together (although we can’t seem to agree on any destination at this point :\). That part doesn’t have me bummed. What mostly had me kind of sad is that I wouldn’t get to see Vermont in the winter or have a full week with my family-in-law since my parents are overseas until mid-April. I’ve seen the place during peak week in the fall, but I’ve heard winters are just as gorgeous. But the great thing about time shares is we can go any year we want. So the point of this post? I wanted something delicious to eat for dinner after my workout, and I was bored of wallowing, so I decided to make sesame tofu. REB and I have made variations of Asian dishes before, and we usually replace the meat with tofu. So far we’ve been pretty successful; the General’s tofu being the biggest successor. I think the sesame tofu either comes in first or ties for first. I see myself making this recipe more. It was slightly sweet, had a hint of spice and that dark smokey taste of the sesame oil really rounded out the whole dish. The combination of flavors plus the fact I used a pretty new plate I found at Home Goods instantly made me feel better and stop having first world problems. The hug from REB when he got home from class didn’t hurt either. Slightly sweet, a hint of spice and a dark smokey taste of sesame oil bring this whole dish together. 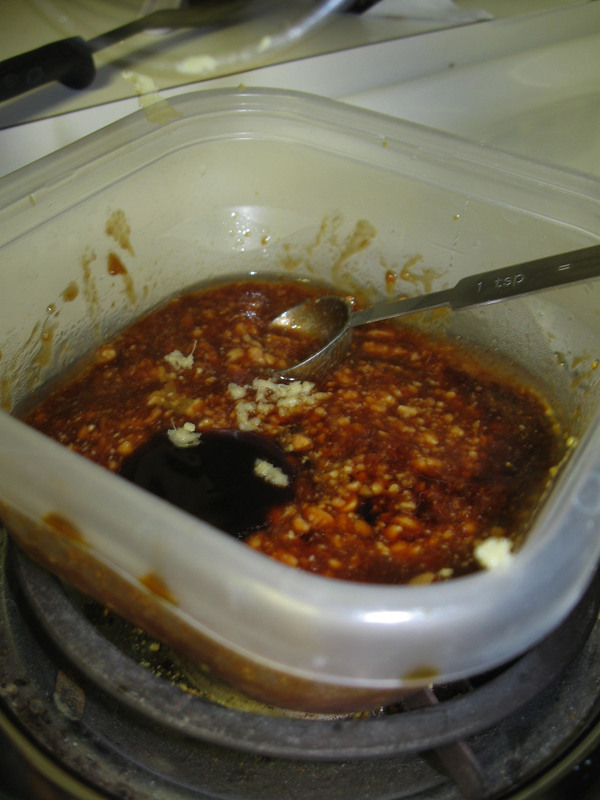 Whisk soy sauce, sugar, sesame oil, red pepper flakes and mirin in a shallow bowl until combined. Add cubed tofu and stir to coat each piece. Set aside and let marinade for 20-30 minutes. In a dry pan, add sesame seeds and heat until toasted and aromatic (about 3-5 minutes). Keep an eye on them so they don’t burn. Transfer to a large bowl and set aside. When tofu is ready, reserve 2 tablespoons of marinade, drain the rest and lightly pat the tofu to dry. 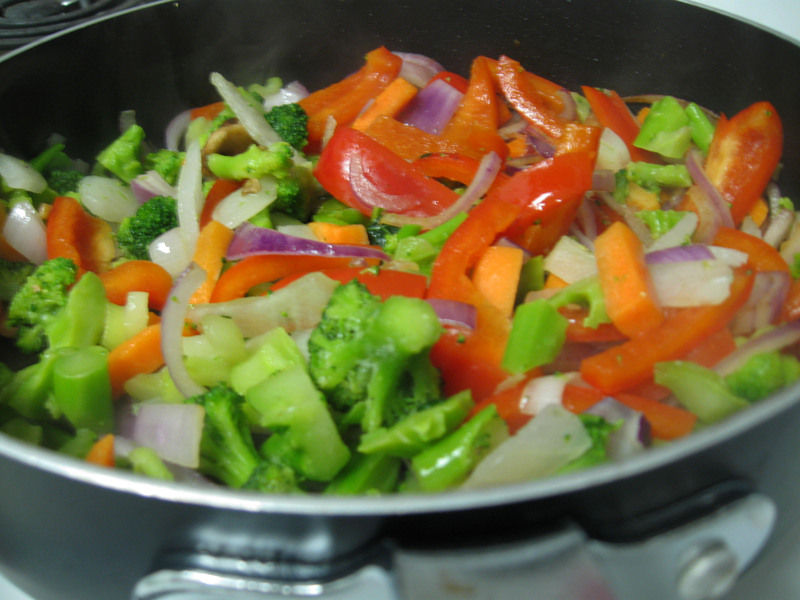 Heat 1 tablespoon vegetable oil in a large deep skillet and wait for it to get hot. Add tofu cubes in batches and brown on all sides. 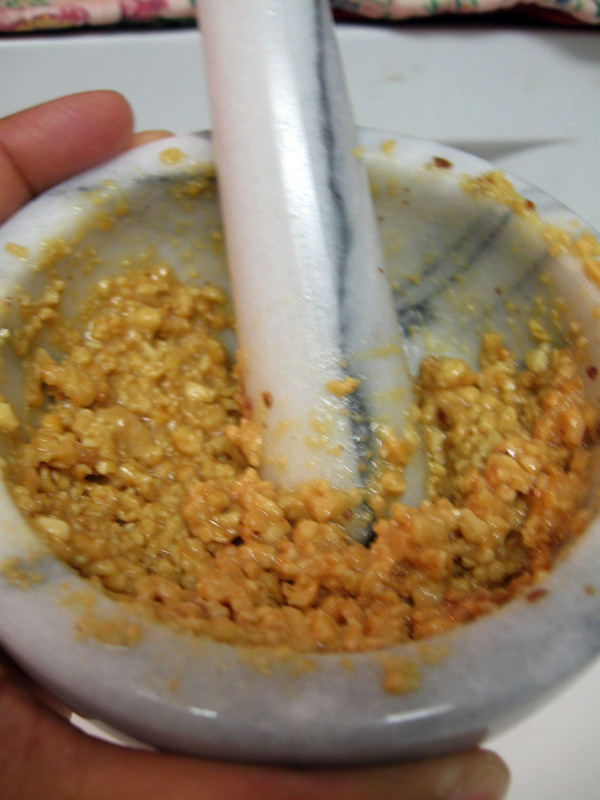 Transfer to bowl of sesame seeds and toss to coat, and set aside. In the same pan, add the other tablespoon of oil and cook scallion, garlic and ginger until cooked through, about 1-2 minutes. Add the broccoli, chili paste and water and cook another 3-5 minutes. Toss the tofu back into the pan with the reserved marinade and cook everything together for another 5 minutes. Serve immediately over brown rice or quinoa. This entry was posted in Asian, Food, Vegetarian and tagged broccoli, low carb, mirin, quinoa, sesame, sesame seeds, sesame tofu, tofu, vegan, vegetarian on January 17, 2013 by Aparna B.. When I stop to think about how I have something going on every single weekend between now and then end of October, the old me would have freaked out. However the new, positive, hip (yes, hip!) me is looking forward to having things going on during the weekends and people I will get to see! Of course being busy on the weekends, just means I’m even busier during the week. Knowing how busy the weeks to come are going to be, I’ve been trying to get grocery shopping done at the beginning of each week so we aren’t scrambling to get certain items each night for dinner. Menu planning is a simple concept, but you know what? It really works! One of the items on the list was extra firm tofu. Sure, it’s a normal thing in our fridge all the time, but I was in the mood to make something delicious. Enter tofu lettuce wraps a la PF Changs. …Minus the calories, fat, MSG and sodium. Making ‘em homemade was ridiculously easy, healthy, spicy (duh), low-carb and full of protein! The basic recipe is from Isa Chandra (the vegan queen of cooking!) and her cookbook: Appetite for Reduction – a must own! All the recipes in there are healthy, delicious and nothing over 400 calories per serving. Total win. And it just so happens that one of the things I’ve been wanting to do is try to cook from each cookbook I have. Challenge accepted. Heat a large, deep skillet or pan over medium high heat. Add the tofu (you can spray some cooking spray if needed) and cook until starting to brown. Add the soy sauce, stir and continue to cook another 8-10 minutes, or until browned on all sides. Transfer to a bowl and set aside. 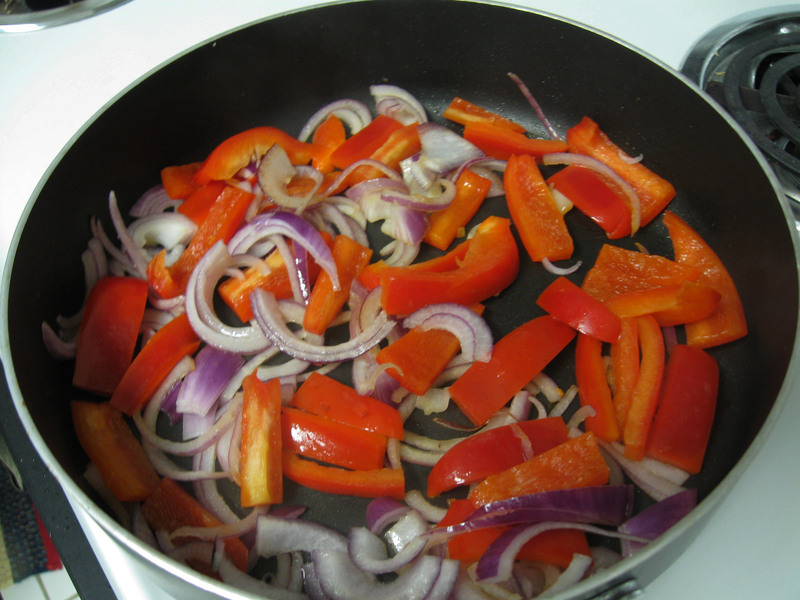 In the same pan, cook red pepper and red onion over medium heat. Add garlic, ginger, red pepper flakes and Sriracha and stir. Add the mirin (rice vinegar) and cook 3-5 minutes. If you don’t have mirin, use sherry wine or white wine vinegar. Lastly, add in the hoisin and mustard and stir well. Toss the tofu back in and coat well with the sauce. Serve it up in lettuce leaves and enjoy! These were so easy to make and so delicious and could be made vegan or gluten-free! You could easily substitute in your favorite protein like beef or chicken or whatever, too. Give it a try, I know you will love them. Do you do weekly menu plans? This entry was posted in Asian, Food, Vegetarian and tagged Appetite for Reduction, Asian, Isa Chandra, lettuce wraps, low carb, low fat, mirin, tofu, vegetarian on September 12, 2012 by Aparna B..
Much like the famed dish that stars chicken, this dish is the perfect one for vegetarians every where! It has a ton of heat, the sauce is smooth and man, is it good. We found this recipe online but jazzed it up a bit for our tastes. We served this with rice, so start by cooking some rice. In a large, deep skillet coat the bottom with vegetable oil, about 2 tablespoons. When it’s nice and hot, add the tofu and cook until brown on all sides. While that’s happening in a 2-cup measuring cup (you know, like those Pyrex doohickies), measure out the soy sauce, water and orange juice. Add the corn starch, minced garlic, cayenne pepper and add some minced ginger and then grate some in there too, Stir it all together and finish cooking the tofu. When the tofu has browned on all sides, reduce the heat to medium and add a few pieces to the sauce mixture to help warm it up to the temperature of the tofu. Then pour it all back into the skillet and then the magic happens. Almost instantly, you’ll see the sauce thicken into a beautiful glaze (ah, the beauty of corn starch! It worked in the 1950s, it still works today!). Let that reduce and continue to thicken for 2-3 minutes. Serve hot over white (or brown) rice. Enjoy! 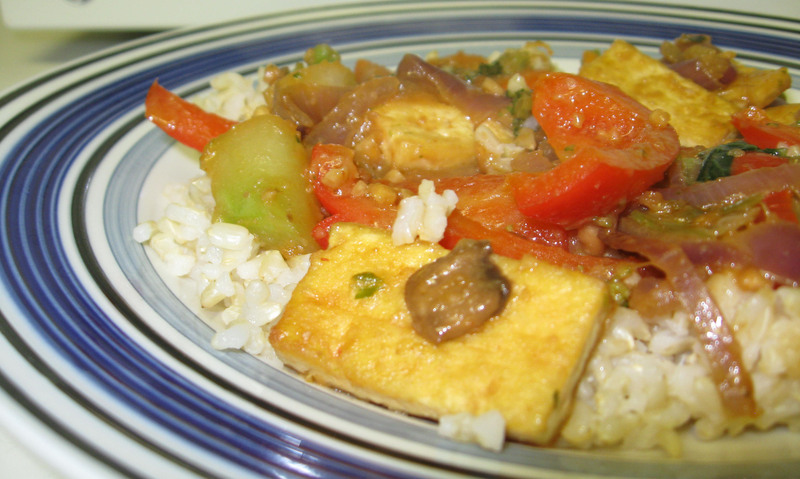 This entry was posted in Asian, Food, Vegetarian and tagged asian food, General's Tofu, tofu on August 4, 2010 by Aparna B..
Had some tofu in the house and I didn’t want to make stir fry since we eat so much rice in this household! Substitute spaghetti and you got some lo mein! •1 pound spaghetti – although we probably should have used 3/4 of the box. And whole wheat. •Grated ginger, I don’t know how much I used. We love ginger so we used a lot I’m sure. Prepare the spaghetti according to the package. Under cook it a bit since you’ll finish cooking it in the pan. 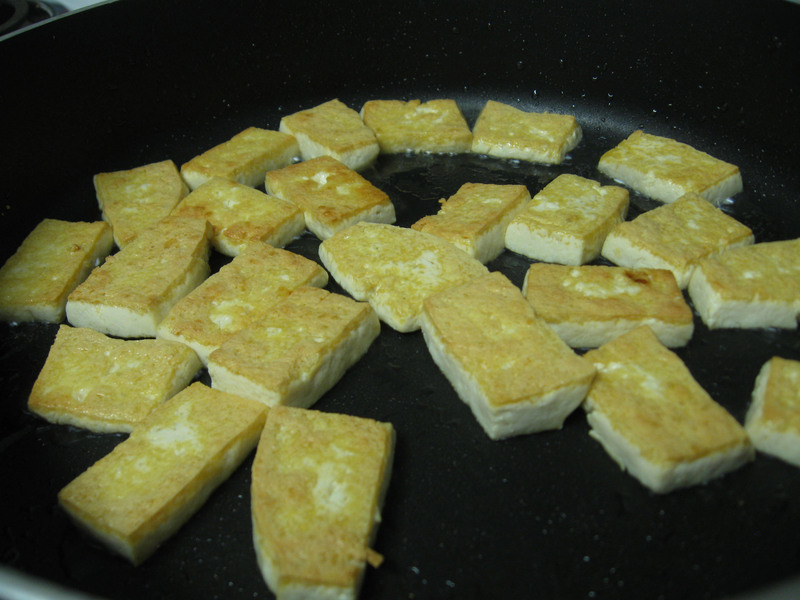 In a large, deep skillet pan-fry the tofu with a little olive oil until they get crispy on all sides. Transfer to a plate and let them sit until ready to toss in with the veggies. 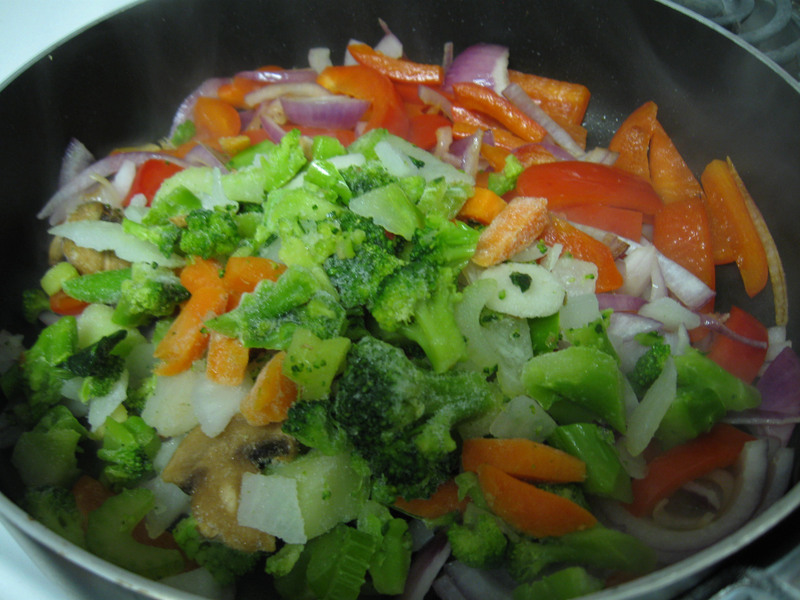 In the same pan, saute all the veggies with olive oil. Add the garlic and grate the ginger directly over the skillet (it’ll melt right in – yum!). Then add in the sauces. You can basically eye ball that since it’s up to your liking how spicy, sweet, salty, etc. you want the sauce to be. Add the tofu back in and stir carefully so the tofu doesn’t fall apart. Toss the pasta right into the skillet, mix, cook a bit and serve! You might need to reserve some pasta water to help keep the noodles moist. Serve and enjoy! 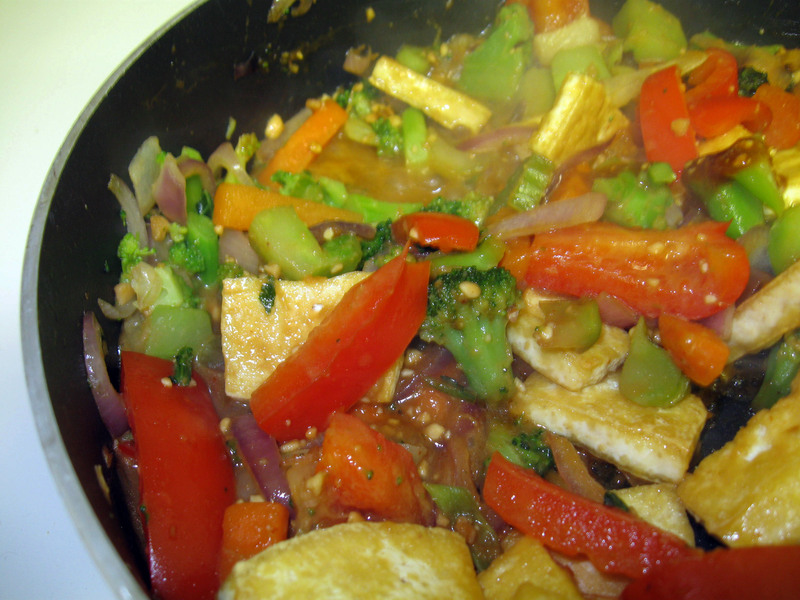 This entry was posted in Asian, Food, Main Dish, Vegetarian and tagged Main Dish, tofu lo mein, vegetarian, vegetarian tofu on May 29, 2010 by Aparna B.. Being vegetarian can sometimes be hard. Since we don’t eat meat, we have to find other ways to get protein into our diets. Good thing we love tofu. (^_^) Tonight REB and I felt a little Asian (a little easier for me than him. Bahahaha) and made a super easy tofu stir fry for dinner. If you’re not a big fan of tofu, you can of course use chicken, beef, pork, whatever you want. 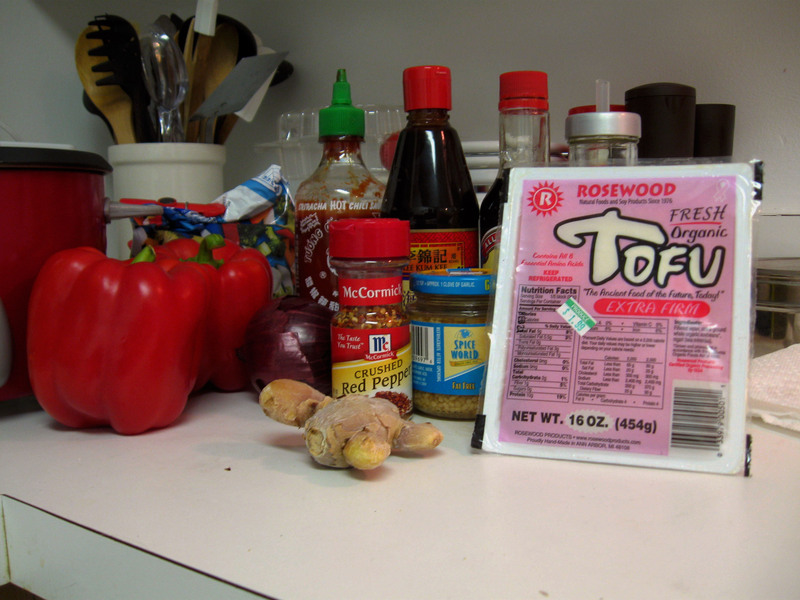 •1/2 package of firm Tofu – this specific tofu we used was actually made and manufactured here in A2! All about supporting our local people! 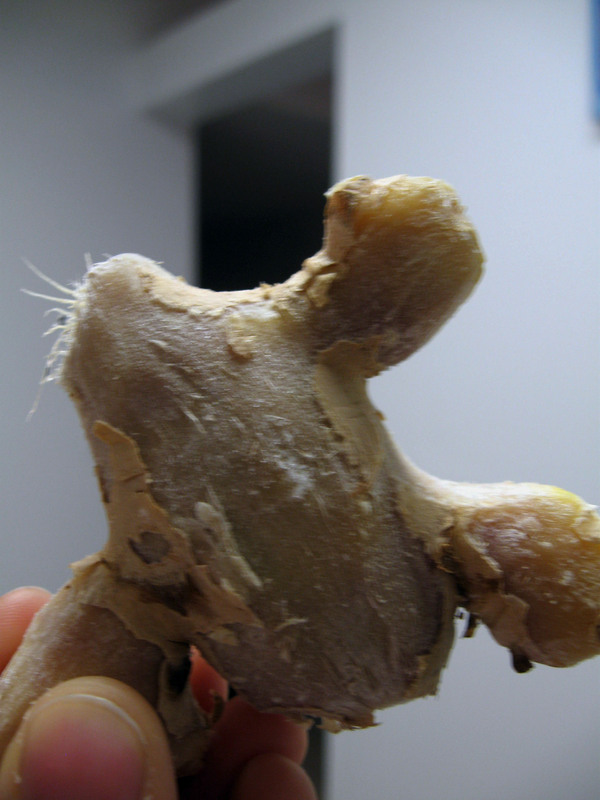 Along with peanut butter, I loooove ginger. I’m pretty sure I’m having a secret affair with ginger (and garlic…….and Siracha. I’m thinking of seeing someone about this…). REB tells me that ginger looks like little babies or humans. OK, enough rambling, let’s get stirring already! Like I said earlier, get your brown rice going before you start making the stir fry. You can, of course, use white rice, but brown rice is high in fiber, the oil in it is very low in cholesterol and it’s vitamin-rich! Heat a large, deep skillet on medium high. Put about 1/2 tablespoon vegetable oil on the bottom of the skillet and wait for it to get warm. 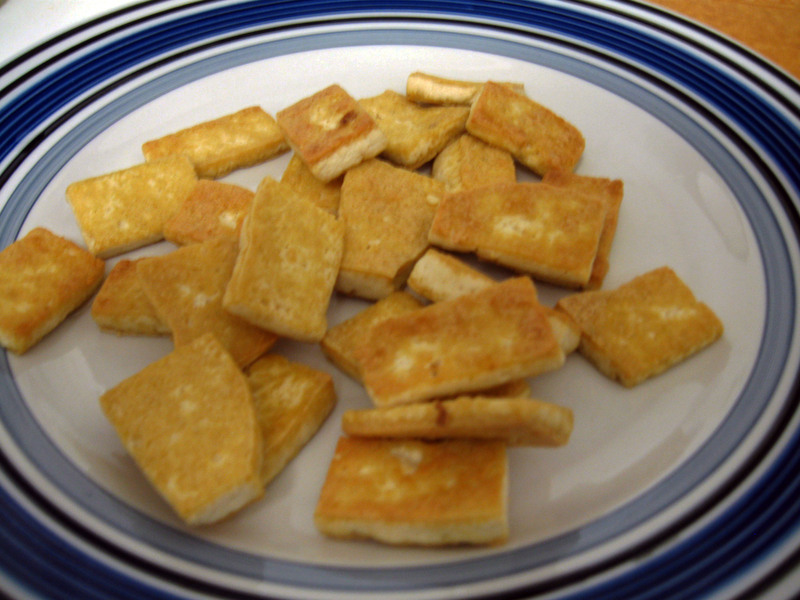 While that’s happening, cut the tofu into 1-inch strips about 1/4-inch thick. You don’t need to use the entire tofu container! You can use half, and store the rest to be used at another time. 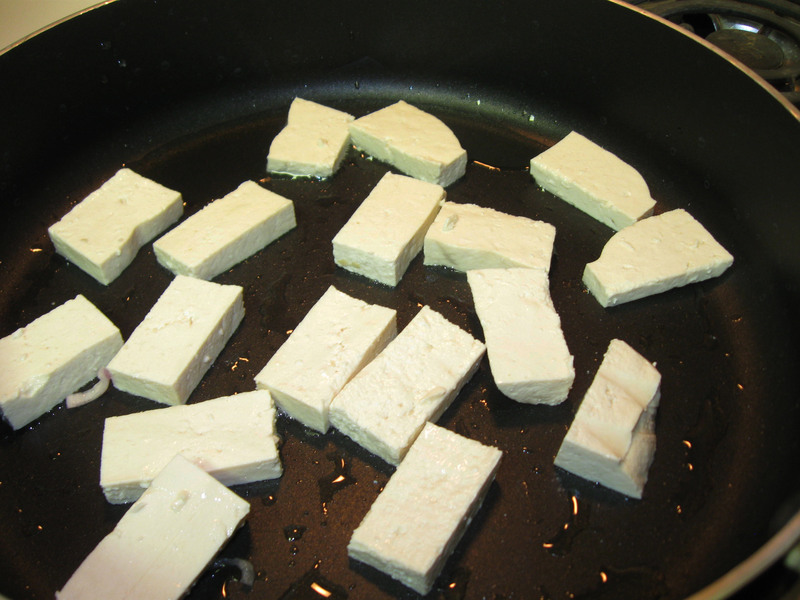 Carefully place each tofu piece in the skillet. Be reaaaaally careful because the pan will be hot! But you want that kind of heat. 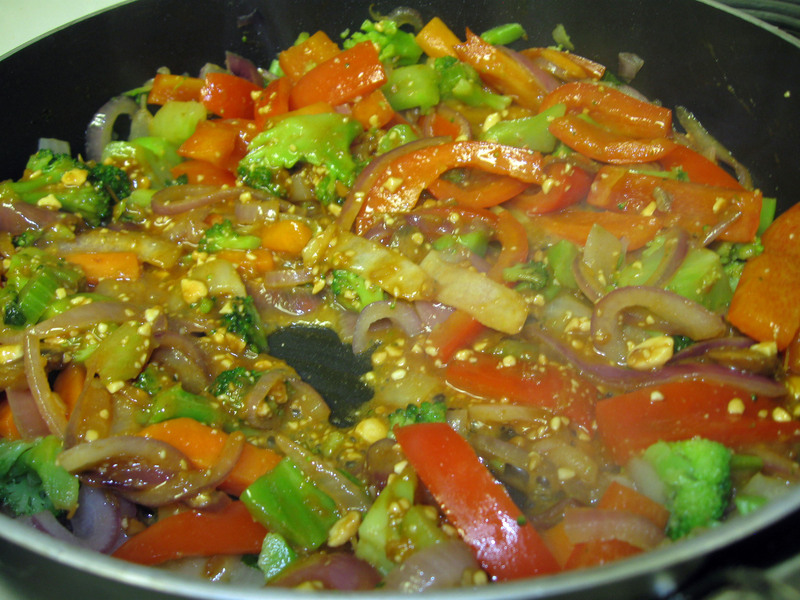 Pour the vegetable oil, minced garlic, grated ginger and Hoisin sauce into a small bowl. If you’ve never had Hoisin sauce before, it’s got the consistency of ketchup so it’s a little thick, but it’s really sweet and savory in taste. A must-have in Asian cuisine! Next, add the honey, Siracha and the peanut butter. Give it a good stir. Last, add the soy sauce (since it’s your salt ingredient) and stir. You may need to grate more ginger into the sauce, which you know I fully support. Stir the entire sauce and taste it. It should be sweet and spicy, which ours was. You shouldn’t need to add any salt to this sauce since the soy sauce more than makes up for it. Don’t forget about the tofu! 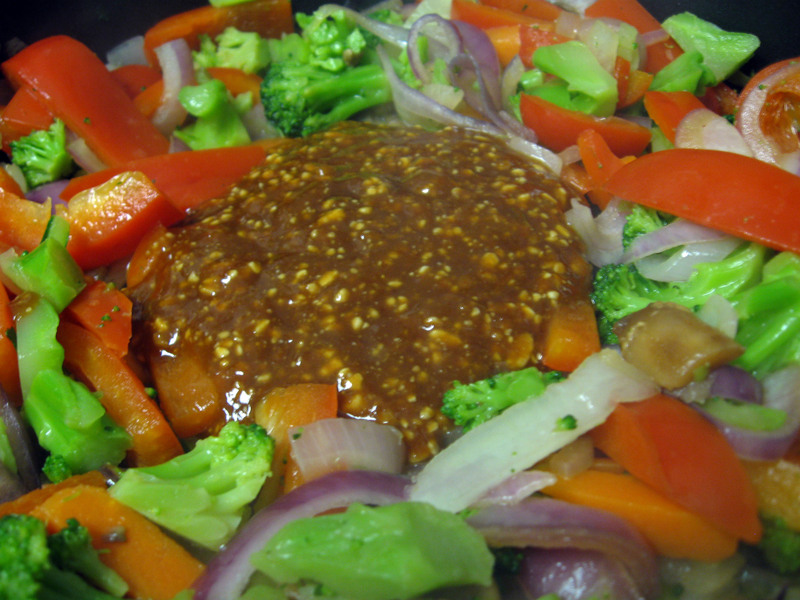 Stir the sauce around to mix all your veggies. Since you’re keeping the skillet on higher heat, it’ll start kind of bubbling away – you want this! Carefully stir it into your stir fry. You want to be careful so the tofu won’t break apart. You shouldn’t really have to worry about this too much with firm tofu, though. If you’re a fan of silken or soft tofu, you’ll want to be extra sure not to tear or mush it up while stirring! Serve it over brown rice and…om nom nom nom! 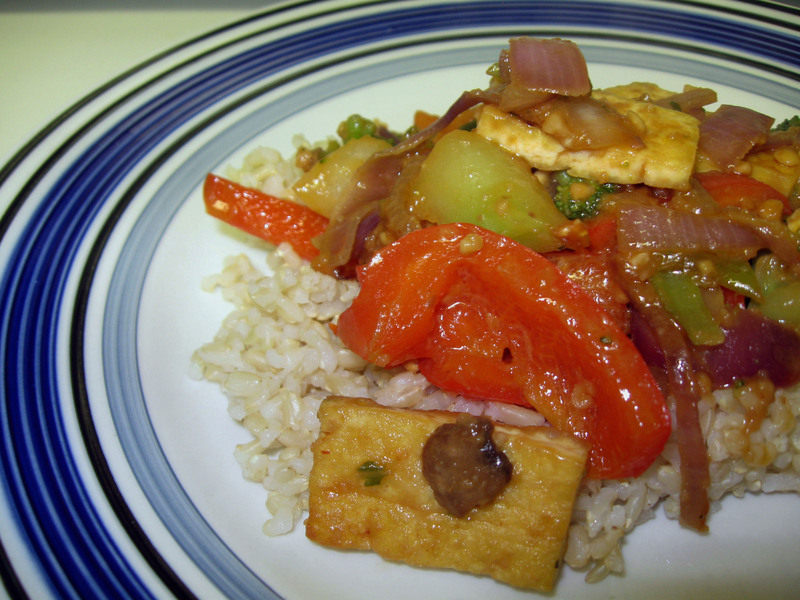 This entry was posted in Asian, Food, Main Dish, Vegetarian and tagged asian cuisine, brown rice, Food, ginger, stir fry, storing ginger, tofu, tofu stir fry on January 13, 2010 by Aparna B..